This post is being developed together with a related one of the ventilation shafts for Crossrail, to show the sort of buildings we can expect to be created to provide access to new rail tunnels under London and other cities. As I travel around the city, I will be adding more pictures and when I think the details are complete, I’ll add a summary. The Channel Tunnel Rail Link goes from Ebbsfleet to St. Pancras in two twin tunnels, which both surface on either side of Stratford International station. The twin tunnels have to have ventilation and emergency access shafts and there are five of them for the Channel Tunnel Rail Link. From East to West approaching London they are as follows. This shaft is in Barking and can be seen on this Google Earth image. The shaft is nestled in the angle of where the A13 crosses the London Tilbury and Southend Line. This page on the Bell Johnson web site, gives an interesting insight into the design of the shaft. There is also an image taken during construction. The picture was taken from the east and clearly shows the road and the railway. These images were taken from a train. The ventilation shaft is to the west of Dagenham Dock station, which is where I turned round to come back into London. As the station is in Zone 5, it is Freedom Pass territory. This shaft is to the west of Barking station and is shown in this Google Earth image. 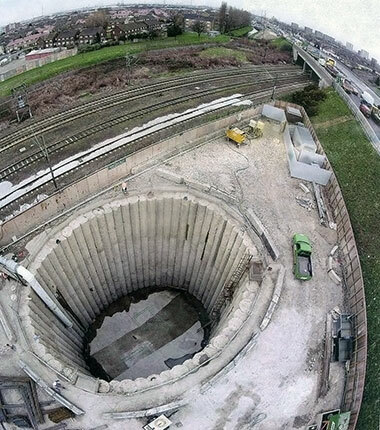 Note that the shaft is to the north of the train lines going into Barking station and to the west of the A406 road. I took these pictures from trains passing through the area. I reckon that you possibly get the best view of the building on top of the ventilation shaft from a eastbound, District or Metropolitan Line train with clean windows. 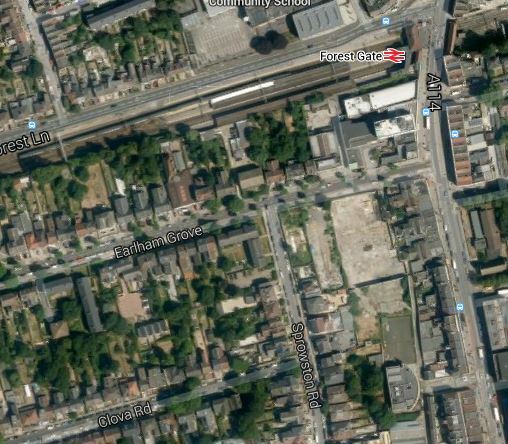 Unless of course, you walk to the Barrington Playing Field from East Ham station. 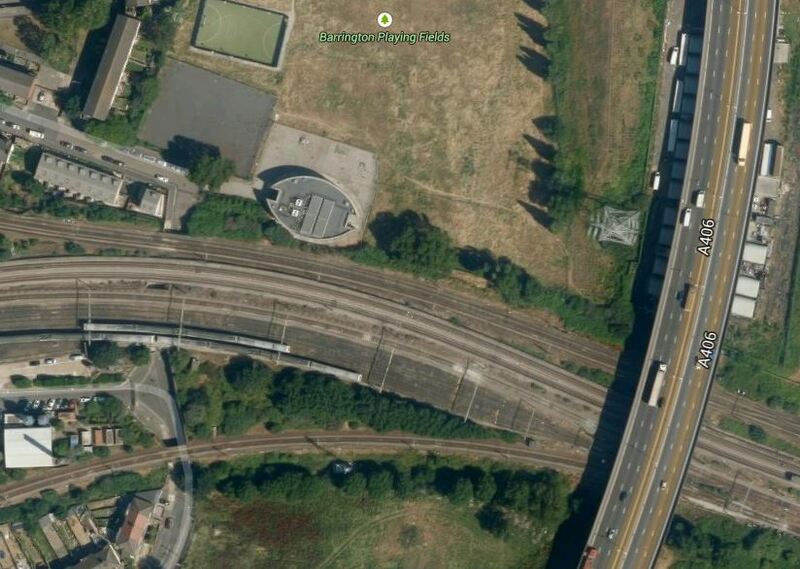 This shaft is located south of Forest Gate station and is shown on this Google Earth image. Forest Gate station is on the Great Eastern Main Line out of Liverpool Street and later next month, it will be taken over by Crossrail. The shaft is directly underneath the station, but would appear to be more tucked away in buildings than the shafts at Wayside and Barrington Road. It is also the only ventilation shaft for the tunnel, that doesn’t have a full elliptical building on top. I tried to take a decent picture of the building, but you can only see one side between the houses. The only point to note, is that in a previous building on the site, Jimmi Hendrix wrote Purple Haze. This shaft is east of Dalston and just to the west of Hackney Central station, close to the North London Line, under which the Channel Tunnel Rail Link was bored. It is shown on this Google Earth image. Note how it lies close to the curve that links the North London and Lea Valley Lines, just to the south-west of where the two lines cross, which in turn is to the west of Hackney Central station. I was able to take these pictures from a train on the North London Line. I shall attempt to take a few more. 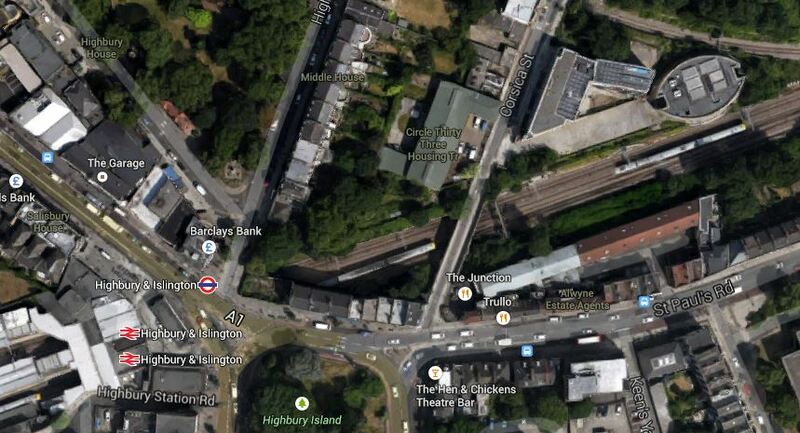 This shaft is just east of Highbury and Islington station and is shown on this Google Earth image. It is another shaft with an elliptical building on top, which you can see in the top-right corner of the image. I was able to take these pictures. Some were taken from Corsica Street looking through the gate and the others from passing trains. These structures have more than a touch of the Martello Tower about them! Ironic really, as these ventilation shafts are there to help encourage the French to visit, whereas the Towers were built to repel Napoleon.